The Cheese and Wine Shop situated in South Street Wellington, has been an essential Wellington landmark for decades, as it still is. Today it`s run by Paul de Ruyter, who along with great staff, continue to service the needs of Somersets discerning foodies, and look forward to supplying the best Cheeses, along with all the other goodies the shop is famous for. In 1998, Paul, a former chef of some distinction, was working as Executive Sous Chef at the Marco Polo Hotel in Singapore. Seeking a return to England, Paul and his wife, Clare purchased The Cheese and Wine Shop from Peter and Geraldine Orr, who had ran the shop for 12 years. 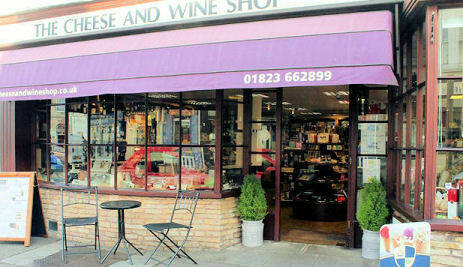 Peter and Gerealdine purchased the Cheese and Wine Shop from The County Stores group, and made it their own, introducing new features, such as Hampers and Gift parcels for national distribution, winning numerous awards along the way. This shot, which we believe dates back to the 1920`s, shows what is today the righthand side bay window. 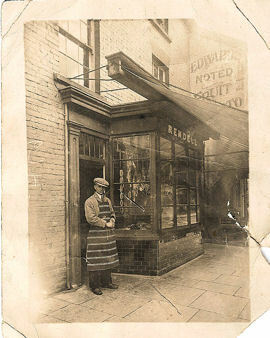 When this shot was taken, the shop was trading as butcher, and we believe was owned by Mr Randles.